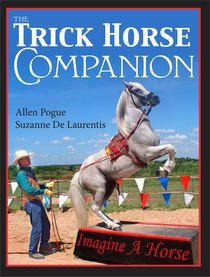 The Trick Horse Companion ! Tricks Aren’t Just Fun - They Create a Fantastic Equine Partner! That’s what the authors of the new book called “The Trick Horse Companion” believe and prove every day at their ranch. In this step-by-step guide that features over 300 full color photographs readers will learn how to teach their equine buddies amazing new skills that will delight any audience; whether around the barn or on the stage. Applying their time-tested methods they call “Enlightened Trick Training”, Allen Pogue and Suzanne De Laurentis demonstrate an easy-to-follow program that builds upon itself the further the student goes with it. With their combined fifty-plus years working with literally thousands of avid horse enthusiasts from around the globe the authors show the reader how to get the best results with their own horse through insight, photos, tips and steps. Allen and Sue bring a lifetime of experience with horses and over 36 years of carefully researched and practically applied trick horse training experience. "The Trick Horse Companion" goes light years beyond just the mechanics of "how" to train tricks and adds the "why" trick training benefits and enhances the horse’s entire being. “The Trick Horse Companion” packs instructions for a series of elements the reader can then build on. • Pedestal Training — the Pedestal gives the horse a go-to safe place to wait that can be expanded. • Tricks of Trust include the Obeisance or Circus Bow, the Bow, Kneel and Lie Down. These are moves putting him in a position that demonstrates great trust in his handler. • Tricks of Engagement include retrieving an object such as a Frisbee, flag or cap. A horse willingly chooses to engage in the activity. Tricks of Engagement create a can-do attitude that develops into a want-to-do work ethic. • Tricks of Agility include the Salute (Jambette), the Rear and Hind Leg Walk, the Sit Up and Sit Down. • Tricks of Gait include amplifications of natural movement as simple as an extended trot or as advanced as the March, culminating in the Spanish Walk. • Liberty Training is the ultimate expression of Enlightened Trick Horse Training. The horses respond to the handler’s cues without any attachments. Hardcover, 242 pages, over 300 full-color photographs. Copies can be personalized (signed) by the authors. Each copy purchased from Imagineahorses comes with a complimentary DVD titled "Using Treats as a Training Tool". This unique teaching aid has information never before anywhere presented on how to use food rewards effectively and most importantly responsibly. 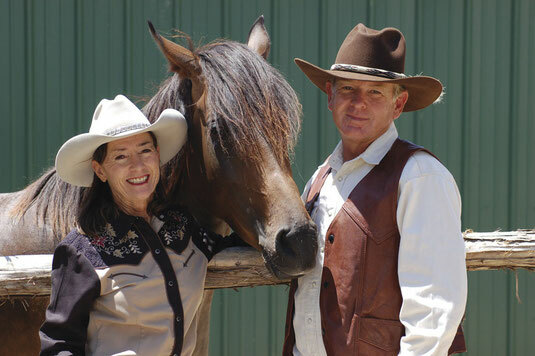 Sue and Allen, a husband and wife team, live in Dripping Springs, Texas and have owned and operated Red Horse Ranch, a 40+ horse boarding and training facility since 1998. They teach people from around the globe how to incorporate “Enlightened Trick Training” methods with saddle training and groundwork to create the “Ultimate Companion Horse”. Imagine A Horse was developed by Sue and Allen and blends modern and classical horsemanship into a fun and comprehensive training philosophy designed to increase the intelligence, adaptability and predictability of today’s companion horse. Their work focuses on teaching horse lovers how to build an interactive relationship with their horses to create a bond that most horse lovers dream for. Their horses, methods and philosophy have been featured worldwide in the finest equine publications. Sue and Allen appeared as clinicians and performed as entertainment at major horse expos for over a decade starting in 2000. Sue's horse Lady C was honored as a Breyer Horse in 2013. A downloadable JPG for print and other media use.